Glyphosate is another of those substances (like fluoride and 1080) that can be the focus of a lot of unease. 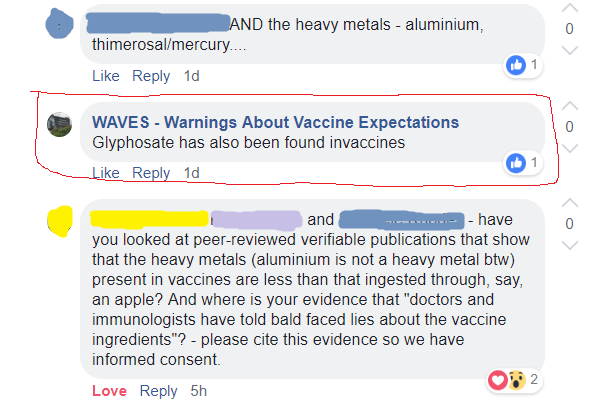 So it wasn’t entirely surprising to see the claim on WAVES’ FB page that glyphosate is found in vaccines. Predictably, various little Gish gallops saw Yellow told that injection and ingestion aren’t the same, and by the way what about mercury? However, Yellow also asked for “evidence that [glyphosate] is above the background levels in drinking water or mother’s milk. 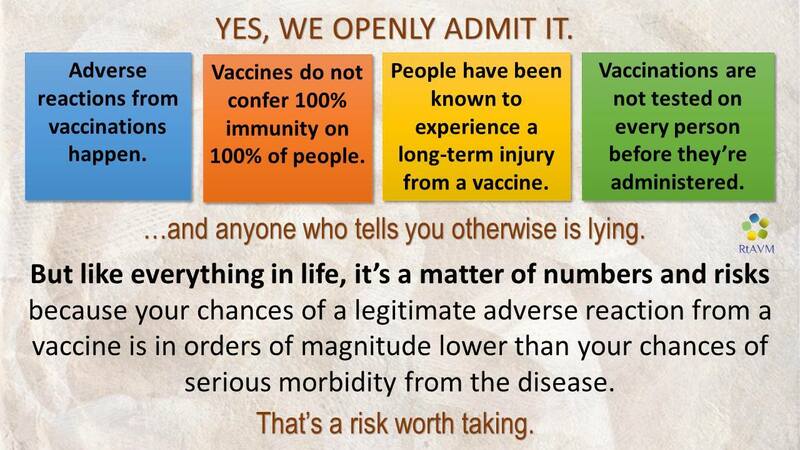 Please cite evidence that glyphosate levels are at dangerous levels in vaccines, as hinted at by “Glyphosate has also been found invaccines” (sic)”. Which is exactly what I’d have asked. For I suspect that WAVES’ claim is based on either a very poor study done by the activist group Moms Across America (MAAM), or claims made by researchers such as Drs Seneff* (who is opposed to both vaccination and the use of glyphosate) and Samsel. The post testing the accuracy of another claim from WAVES appeared first on BioBlog. — The authors of the quote who criticise Seneff’s ‘research’ on glyphosate, Robin Mesnage and Michael Antoniou, are themselves considered with caution by some. (AFAIK) Mesnage and Antoniou still have not released data from their own study claiming differences in RoundUp-ready maize, despite releasing the data being a condition of publishing in Scientific Reports, and researchers having asked for the data for over a year now. Their conclusions are considered by some to reflect contamination and technical issues—i.e. their conclusions are not correct. These concerns might be resolved by inspecting the data, but Mesnage and Antoniou haven’t (or won’t) release the data. I’m one of several who have been trying to gently encourage them to release the data. One of the authors is Séralini, and the source material is sourced from Séralini’s lab. For those not familiar with the Séralini name, saying he’s very ‘controversial’ in the glyphosate space would be polite (I’m pretty sure I’ve written about him earlier on Sciblogs, Alison might have too). There’s a long history of people telling MIT they ought to bring in fresh blood, i.e. move on past Seneff (myself included; the field itself is fine, and can stay). Some have suggested that one ‘catch’ to removing Seneff is that her husband has/had a senior position in the MIT institute she works at (CSAIL). Yes, I had wondered that from their subtext. I thought it interesting to see them (& others also very obviously of Seneff’s overall persuasion) criticising her so heavily on this one.